The summer in my neck of the woods has been so disappointing.... not hot *at all*, too much rain and a few weeks mired in the stench of a city-wide garbage strike. Now just as the striking garbage collectors have resumed their duties, and the first (FIRST!) humid, hot weekend has been racked up under our belts (in AUGUST! WTF!? 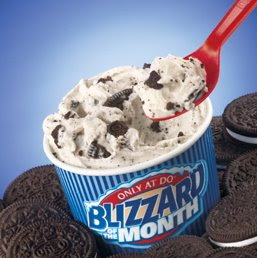 ), the Dairy Queen brass have unleashed a classic of a Blizzard to help salvage this wasted summer. May I introduce you to the Oreo Blizzard. Yes, it has been around before but classics NEVER go out of style and this frozen cookie & ice cream marriage is very welcome right about now. The Oreo Blizzard is back because Thursday August 13 is Miracle Treat Day. On this day all proceeds from Blizzard sales across the country will benefit the Children's Miracle Network. So head to your local DQ on August 13 and indulge in a delicious Oreo Blizzard! A great reason to have one (as if I needed one! ).